NO – 2 exceedingly simple English syllables, and yet, there’s nothing simple about it! This word is perhaps the most conflicting word in the English dictionary. Think about it – we all feel compelled to use it at some point in our life, but we universally hate to be on the receiving end of it, especially at work. The moment you use this dreaded word at work, you’re deemed a jerk, a slacker, a tantrum-thrower, or even a spoilsport. But then again, if this word never resonated in your verbal dictionary, you would become a door-mat allowing others to steamroll you at work. See, conflicting! In this post, we show you how to achieve the impossible – how to say ‘No’ at work without sounding like a jerk. With these potent tips, you will see that it is indeed possible! Let us be clear here: an “almost-Yes” is not a ‘Yes’. Instead, it’s like a “Give me time to think about it,” buying you time to know more about the requested commitment. You see, nobody likes a person who refuses without reason. We’re not saying that you have to accept every request that comes your way. But we are saying that if you begin your response with a direct “No,” you will quickly develop the dubious reputation of being a jerk. Instead, throw in words like “sure,” “certainly,” “possible,” “I can,” etc. to disarm the other party. I’m sure there’s something I can do for you. I will certainly get back to you. None of these phrases indicate a firm commitment. Yet, they are likely to receive a better response than a direct refusal. 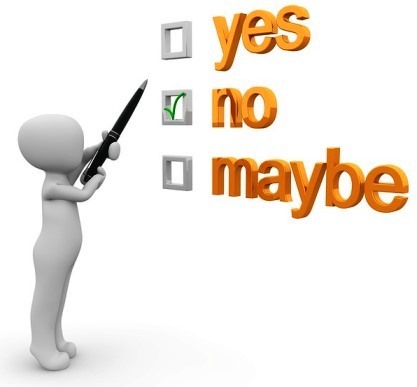 The almost-Yes empowers you to find out just how unreasonable that request is, before you make a justifiable decision to decline it. This is often a misunderstood sentiment, so we will spend a little time here. Unlike sympathy, empathy empowers you to acknowledge the other person’s position and care enough to help right. An attitude of empathy also empowers you to receive every request with clarity. You don’t doubt that the other person is out to make things difficult for you. Instead, you know that the request is genuine, and hence respond rationally to it. For instance, consider that a new employee walks up to you – the chief receptionist – and asks if you can help track his missing id. You sense that he’s worried, and you know that this can be fixed by a cumbersome yet productive call to customer service/ security. Without empathy, your focus lies on the large pile of work waiting on your You rattle off the customer service number and go back to your work. While this response may seem reasonable, this may also come across as downright obnoxious. (The guy is new so he probably deserves a break). With empathy, you take a short break to reassure the newbie that this is no big deal. You also call customer service yourself and guide the newbie to the right operator. This should take you less than 5 minutes, but can win you an admirer for life. Here’s another example: Consider that an employee walked up to you – the accounting rep – and requested for a detailed salary statement (by month) to plan his tax. And he does this when you’re swamped with year-end work. Without empathy, your focus lies on the large pile of work waiting on your You ask him to come later inadvertently delaying his tax-saving plans. With empathy, you understand his need for tax-planning. You are keen to help but share with him the high-priority tasks waiting on your desk. The detailed statement he wants will take longer and should hence be relegated to later. But perhaps you can help him by quickly pulling out the relevant figures of his total pay, so he can make some progress while he waits for the detailed report? Chances are that he’ll respond positively to this. You take time to listen without resistance. You send out vibes of being a fair, approachable and supportive being (which you certainly are). You also invite the other person to respond in the same way. Okay, so you’re swamped with work and find yet another request coming your way. You do feel empathetic to the other, but there’s absolutely no way you can take on more. Or so you think. We often misinterpret external requests as we assume that they entail more work for us. But this is not always true. You may come across a task or request that has been specifically designed to make things easier for you – perhaps it can streamline a cumbersome process, or help you get things done smoother and faster, or even (gasp) reduce your workload. With more companies focusing on the “less-is-more” paradigm (less effort for more productivity, less data for more impact information, etc. ), it’s been known to happen. So dig deeper to find out exactly what the additional request entails for you, before you turn that almost-yes into an unattractive No. You’d be amazed at the amount of miscommunication Corporate suffer. (You say to-ham-to and the other says to-may-to, both referring to the humble tomato!) So always paraphrase the request you receive so the other party understands what you understand. Here, it also helps to paraphrase your request as you break it down to do-able tasks. The other person becomes aware of the effort involved to fulfill the request. Often, this is the point where the other understands the unreasonable effort involved, and either simplifies his request or withdraws it altogether. End result: you’ve achieved what you wanted without using that dreaded 2-syllable word. Nice! Let us reassure you here – this is not about passing the buck. But it is about using the right attitude to redirect a request to the right person. We often get annoyed with misdirected requests. In fact, these form the bane of corporate existence as saying ‘No’ here may portray you as an insensitive slacker. But what if you were to redirect a request with the intention of getting things done? For instance, consider this unusual situation: You’ve been the unanimous rep for the accounting department and all employee requests are directed your way. But since you’re swamped with year-end work, you’re considering redirecting some of it to your colleague, Macy. You let know Macy know upfront so she’s comfortable sharing the work. When you receive a new request, you take a minute to review it before shooting a helpful note to Macy on the nature of the request. (Example: print detailed salary statement for employee ABC from worksheet XYZ). You also update the original initiator on this and further request him to pass the word on new ownership: Macy is the new point of contact for accounting requests. However, you remain available to help. This is a quick one: Let’s say that you find a genuine request coming your way, and you’re convinced that you are indeed the right person to work on it. But, you simply have no time in the present. Consider deferring the request rather than responding with an outright No. The ability to take responsibility is a big asset at work. So if you sense the importance of a request while noting that it is not necessarily urgent, talk to the requester about “delaying” the request. This can win you surprising brownie points IF the other senses your genuine commitment to take on the job at a later time. Yes, we finally reach that direct ‘No’ that you simply have to use, in order to stay empathetic. A direct ‘No’ is the only response for all those (NOT) “yet again” times when you become the fall guy for another’s goof-up. The trick lies in differentiating these from the almost-yes situations. This is when that co-worker asks for your help on the monthly presentation for the fourth time in a row. Or your teammate forgets to let the client know on the hike in rates, yet again. And requests your superior interpersonal skills to smooth things out, yet again. Or when your boss assigns that thankless job that nobody else wants, promising that it will be different next month, yet again. You’re committed to another’s learning. You’ve more than done your bit, and it’s time for the other to catch up while you move on. This is also the type of response to use when you do not want to shun a future opportunity. For instance, let’s say a co-worker invites you to a weekend brunch, and while you’re keen to go, you’ve got pending commitments to take care of. You would also like to leave room for future invitations. Again, pepper your ‘No’ with kindness while explicitly clarifying your reason for refusal. This will ensure that your relationship stays cordial while giving you the leeway to get out of unexpected commitments. All right, so we’ve taken great pains in tips (1) through (7) to ensure that your response is anything but that of a jerk’s. BUT – there will be situations where you have to literally put your foot down as you grant a polite but aggressively firm ‘NO’. This is essential when you want define strong boundaries. A client or co-worker invites you to socialize outside work, and this is against company policy. A team mate constantly expects you pick up his portion of work when he slacks. You receive any sort of social/ personal/ cultural/ financial/ professional requests that are clearly unwelcome and outside your comfort zone. You are dealing with a person with a reputation for being insensitive or obnoxious. There is no softening this response. You want the person to get the message, even if it seems harsh at that time. Understand here that you are not a jerk, and you’re entitled to refuse without guilt or apology. Depending on the situation, you may feel inclined to additionally share the reason for your refusal. As you can see, this post teaches you to subtly say ‘No’, while saying ‘Yes’. However, there will be times when your answer should be nothing but a straightforward ‘Oh Yes’. To check if this is one of those times, find out who’s making that crazy-unreasonable-time-consuming-not-your-job request. If there is a request coming your way from THE top guy at work, (and by this, we mean that person who signs your pay-cheque, your boss’ pay-cheque, and his boss’ pay-cheque), you’re better off getting on top of it right now, no questions asked. But, there’s good news. These are also the kind of requests that will be backed by your boss, and perhaps even his boss. (Remember those pay-cheques!) So don’t feel shy to enlist their share of help to complete these ridiculously-high-priority tasks. This may include re-prioritizing pending tasks with your boss, enlisting his or her help to get information quickly or even taking on an “assistant” to speed things up. As any seasoned professional will tell you, corporate relationships thrive when you’re able to effectively communicate a harmonious ‘No’ even when you’re saying ‘Yes,’ or vice versa. Don’t just give in to your immediate instinct to get out of a task. When used right, your ‘No’ can be used to expand your mentor ship with a junior, expand your association with a teammate, or strengthen your partnership with a client. Make the effort to use these tips to build thriving and mutually-enriching partnerships (not mere associations).